Born and raised in Vietnam, Hanh Nguyen is a young pianist who devotes to seeking and sharing the essence of music. 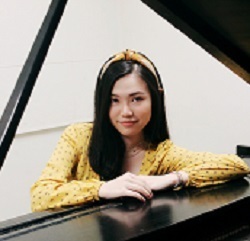 She pursued the Bachelor of Music degree in Piano Performance under the guidance of Steinway Artist Richard Cionco and Professor Kirsten Smith at Sacramento State School of Music, where she was chosen to perform at the very first Honors Convocation in 2019 and to be the recipient of the Sacramento Saturday Club Scholarship. She also spent a year in Southern California studying the Taubman Approach with Professor Nina Scolnik from UC Irvine. Hanh began piano lessons at a young age. After moving to the States, she continued lessons with Sacramento-based pianist and music director Jennifer Reason. At age 14, she was the accompanist for three choirs at Florin High School. She also served in the community as a church pianist and an accompanist for various services. Hanh was accepted to the Hartt School of Music with a Performing Arts Scholarship. At Sacramento State where she attended as an undergraduate, she has been chosen to perform in various masterclasses with world class artists such as Kirill Gliadkovsky, Anton Nel, James D’Leon, and Petronel Malan. In 2016, she performed at the Orfeo International Music Festival in Vipiteno, Italy as soloist and chamber musician. Aside from performing, she has been teaching adult and younger students in both Northern and Southern parts of California. Ms.Hanh believes that to choose music for any reason, either a professional career or simply for one’s enjoyment, is a commitment to a journey that is rather exotic and rewarding. She provides a flexible manner of instruction, for each student is unique in their own ways. Students will learn to approach the instrument in a holistic way: engaging their body movements, training their ears, and developing their technique. The enjoyment of music and the training go hand in hand: Students will be rewarded with all the joy that music offers, and at the same time, shaping their characters with patience and discipline.